For a while, I've wondered about this grave marker in East Cleveland Township Cemetery. It appears to have been made in the 1830s or 1840s. The style is one that I've occasionally seen in advertisements from the period, but rarely in person. Rudolphus is best known as a surveyor for the Connecticut Land Company. He later had a tavern on Woodhill Road at Buckeye. 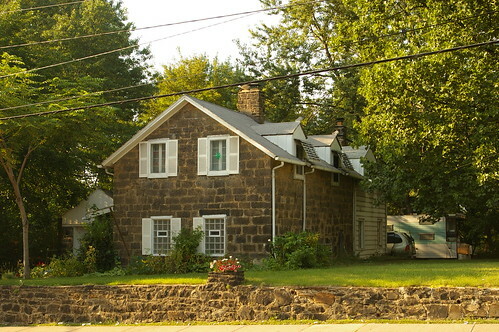 His son, Rudolphus, Jr., built this house at 10701 Buckeye Road, in about 1840. I covered it in some detail a while back - and hope to provide some additional coverage in the near future. 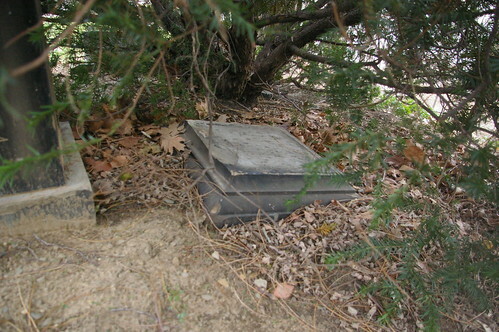 The Edwards family plot at East Cleveland Township Cemetery also includes two more traditional markers. One, I cannot read - it appears to date from between about 1820-1840. 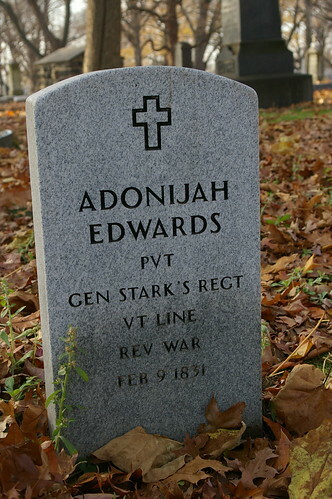 The other is a recent marker, for Revolutionary War veteran Adonijah Edwards. Why does this bug me so? 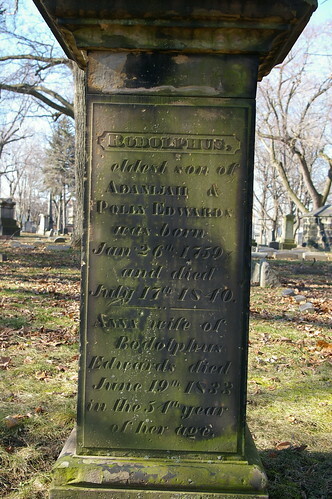 The marker appears to date a couple decades before the cemetery opened, and is in rather good condition for the age. Further, it's of a style that I don't usually see around here. There's clearly a story - but what? Finally, Wickham (Pioneer Families of Cleveland, p. 37-38) provides the answer. All the members of the Edwards family who died in Cleveland were buried in a small cemetery in the rear of the old Congregational church, north-west corner of Euclid Avenue and Doan [now East 105th] Street. 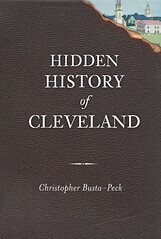 It was then called the East Cleveland burying-ground. The entrance was from Doan Street. The largest and the finest monument in it, and, eventually, the last one, was that of the Edwards family, and, finally, when all the bodies had been removed from the cemetery, this, with other Edwards grave-stones, remained standing until the old church was razed. A big bank building stands on the site of the little church, and part of the cemetery is covered by another towering edifice. 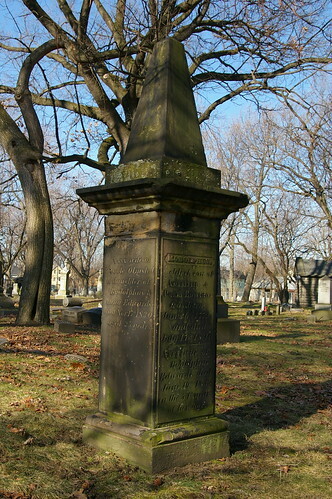 But one similar marker comes to mind in the area - that of Sarah Currier, in First Presbyterian Churchyard, in East Cleveland. It isn't as grand - it lacks the obelisk of the Edwards marker - and further, the capital, shown here, was knocked off at some point. 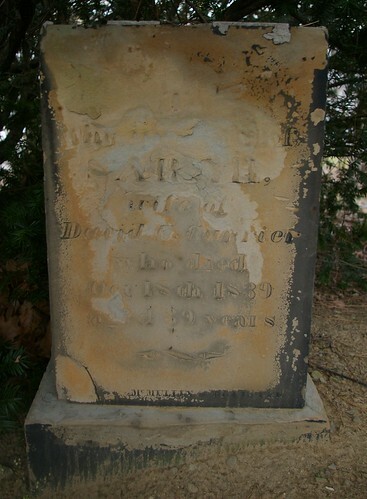 The Edwards marker remains a grand monument to the family. Try to imagine it in a little cemetery at the northwest corner of Euclid and East 105th Street. The design of the mystery grave marker is very familiar to me. 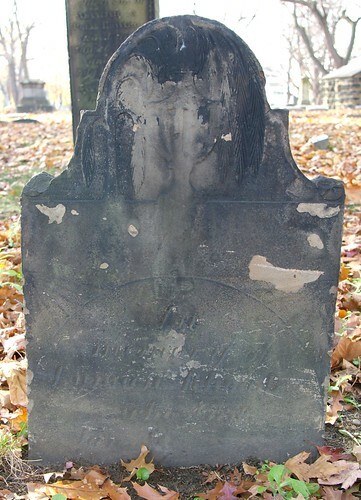 See the headstone of Martha L McIlrath (http://www.findagrave.com/cgi-bin/fg.cgi?page=gr&GRid=9096564) who died in 1822 and is also buried at First Presby. There are obvious differences - the style of the tree of life and the inscription itself are quite different - but the shape and proportions of the stone seem nearly identical. Did you get a shot of the fourth side of the obelisk? In the process of genealogy research, I found that I have approximately 4 ancestors buried there. There are no markers and for one of them they have no card on file. I was very surprised to discover that Black families are buried there! Mine! I spent some time there one afternoon and shared the cemetery with a deer. There are unfortunately a lot of unmarked graves and missing files (from the fire that damaged the gatehouse). I was lucky enough to find that even though my great-great uncle does not have a stone (not sure he ever did), his cemetery file card survived. It's a lovely place to spend an afternoon, and the Foundation has put a lot of effort into preserving it. Wow for connecting the obelisk to the stone house on Buckeye. This is the same cemetery where Amos Sutton Hayden, the first principal of the Western Reserve Eclectic Institute (since 1867 Hiram College), is buried. I was taken there by friends on a misty autumn evening last year; one of the most atmospheric experiences in my life! I never knew that! I wonder if that's the same Hayden family for whom Hayden Avenue, nearby, is named. Christopher, what is the DOD of Sarah Currier? 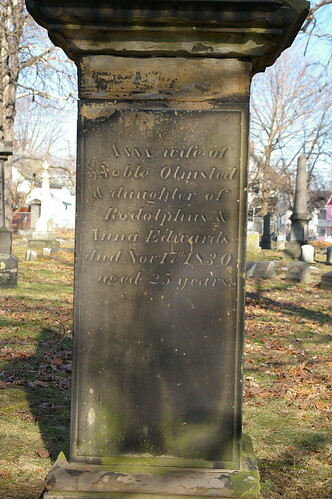 Curious to find out if she's related to my Susan Currier (Amsden) 1790-1859. The very first clue this monument is not original to the cemetery is the material, which is sandstone. If you notice the other sandstone markers in that general vacinity all pre-date the opening of the cemetery. There aren't too many cemeteries in Cleveland that were closed and had the markers and remains moved, but it's interesting to note the population patterns of the old and new burial sites and what was developed on the land once it was decommissioned as a burial ground. Late to the party, but I just realized last night that they "moved" again, or at least their memorial did. 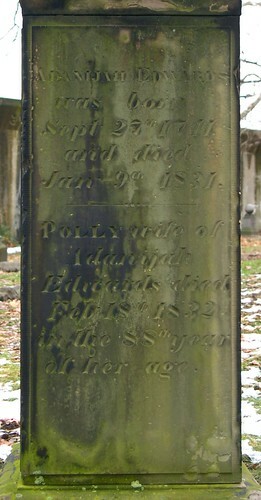 The four members of the Edwards family listed on this monument also are included on a newer family monument in Woodland Cemetery. I haven't done any research yet to establish if they were moved again or if the family just wanted to include their names on the marker at the newer family plot. I've scheduled the post with photos of the two markers for this Friday.